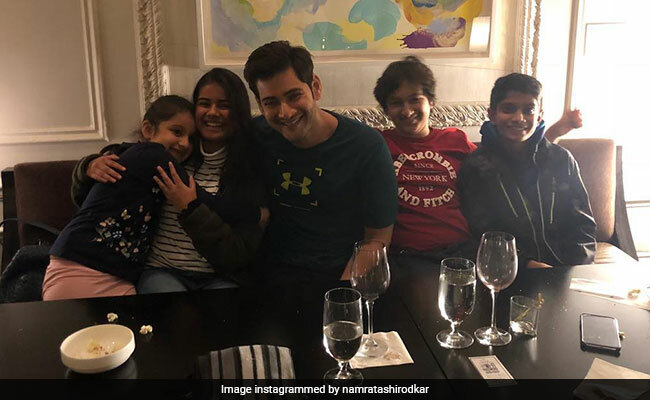 Actress Namrata Shirodkar, who has been documenting highlights of her New York trip with family on her Instagram timeline, shared a photo featuring husband Mahesh Babu and kids Gautham Ghattamaneni and Sitara. The trip to New York, where Namrata's actor-husband Mahesh Babu is shooting for his next film Maharishi, became a family retreat of sorts. From the photos shared by the actress, it appeared that while Mahesh Babu was busy shooting for the film, Namrata and kids were having a gala time exploring the Big Apple. Finally, Mahesh Babu took some time off his busy shooting schedule and spent some quality time with his family. Namrata captioned the photo: "My cuties." She also added hashtags #familyties and #hellonewyork. "Lovely pics," is the general sentiment on Instagram. Namrata Shirodkar has been sharing multiple pictures of her of her children enjoying the vacation (of sorts). In one of the pictures, Gautham and Sitara can be seen exploring New York's famous Central Park. In another picture, Gautham can be seen sitting on bench. Namrata captioned the post: "Always in his own world." The Bride And Prejudice actress surprised Instafam when she shared a photo of Sitara with none other than Alia Bhatt. From the caption it appeared that Sitara is a big fan of Alia and was overwhelmed to meet her in New York. ."Sitara's day out. Her most favourite girl of them all. Thanks Alia for bringing the biggest smile on her face," read the caption on her post. Namrata Shirodkar made her Bollywood debut opposite Akshay Kumar and Sunil Shetty in Purab Ki Laila Pachhim Ki Chhaila has worked in films like Vaastav, Pukar among others. Namrata Shirodkar married Mahesh Babu, her co-star from Vamsi in 2007. She was last seen in Gurinder Chadha's Bride And Prejudice, co-starring Aishwarya Rai Bachchan.